Brands We Carry: Daltile | Shaw | Crossville | American Olean | Marrazzi | Laufen | Florida Tile | Shaw | A.F.I. 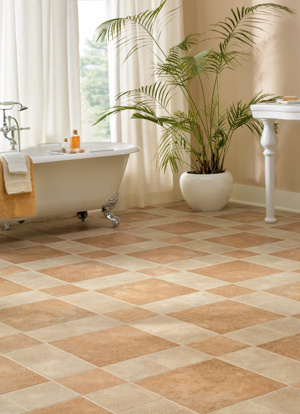 The Classic Look Of Ceramic & Porcelain Tile. Ceramic & porcelain tiles are the perfect choice for homeowners looking for a beautiful and durable tile floor. Classic Carpet & Flooring offers a wide selection of residential floor tile in a multitude of designer coordinated styles and colors, along with decorative tiles for customized borders. You can choose large formats, add decorative inserts, or select a unique floor patterns to set your floor apart from anyone else’s. When it comes to ceramics, you can be as creative as you want and still get a classic look. Tile is a classic look that is considered a smart investment in your home. With so many unique colors and options for accents and installation, each tile floor is truly a one-of-a-kind and perfect to make your home truly distinctive. Call or click today to set up a free no-obligation shop-at-home appointment with one of our design consultants.